Vermont's mandatory labeling bill, which is being appealed, is set to go into effect in July. Congress is debating whether to supercede the Vermont law and other state-by-state initiatives by passing a measure with agreed-upon voluntary guidelines. The Grocery Manufacturer's Association has launched what it calls a "SmartLabel" initiative to voluntarily put bar code labels on foods, which would disclose a laundry list of information, from nutrition facts to the source of foods to breeding techniques--including the use of genetic engineering. Anti-GMO and pro-labeling organizations--most of which are the same groups, as biotechnology opponents--view labeling as a means to the end of removing foods with GM ingredients from the marketplace, and are using their opposition to the recently-approved AquaBounty GM salmon to stir public concern. The issue of mandatory labeling of food and beverage products containing GMOs (Genetically Modified Organisms) is a contentious one that is being fought on battlegrounds ranging from municipalities and counties to the state and federal level. 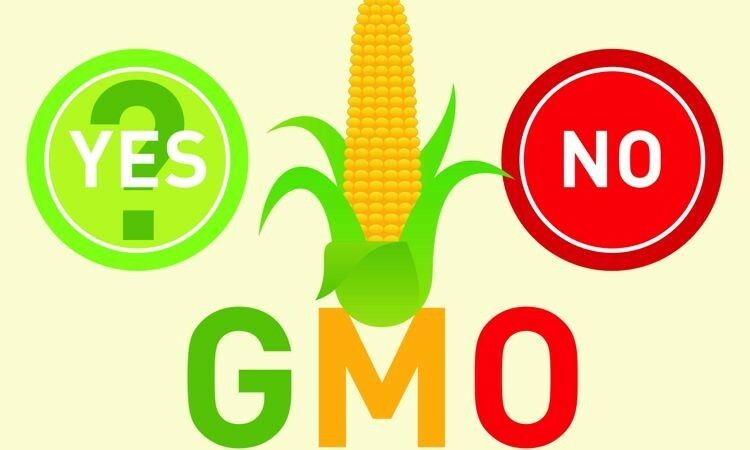 In May 2014, the Vermont legislature approved H112 which mandates that food containing genetically modified organisms (GMOs) to be labeled effective in July, 2016. Connecticut and Maine have approved similar legislation, however, their laws will not take effect until other states pass similar legislation. Maine's law requires five neighboring Northeastern states pass labeling laws while Connecticut's law requires states with populations totaling more than 20 million to pass similar laws before its takes effect. According to the Center for Food Safety, some 70 bills have been introduced in more than 30 states to require the labeling of GM foods, while other states have tabled or rejected mandatory labeling bills. Mandatory GMO labeling has also appeared on state ballots. Initiatives lost in California and Washington in 2013. Colorado voters voted down a similar initiative in 2014 and in Oregon, which was the first state to reject a mandatory labeling law in 2003, defeated Measure 92 by the narrowest of margins, 815 votes. In each of these state initiative battles, a coalition of agricultural producers, the Biotechnology Industry Organization, food and ingredient processors, and food and beverage manufacturers has opposed the mandatory labeling initiatives. They have formed a national organization, the Coalition for Safe and Affordable Food (CFSAF) whose mission statement declares that "CFSAF is dedicated to providing policy makers, media, consumers and all stakeholders with the facts about ingredients grown through GM technology." The state initiatives have proven costly. Each side has spent millions of dollars supporting its point of view. Proponents of GMO labeling argue that they have been beaten by industry pouring money into campaigns that they claim are simply about the consumer's right to know what's in their food and they argue that their proposals will cost nothing more than changing a little ink on the label. A number of prominent journalists such as British environmentalist Mark Lynas, Washington Post food writer Tamar Haspel, risk expert David Ropeik and Guardian sustainability writer Marc Gunther have concluded that the industry fight against labeling is futile. All but Gunther have endorsed one version or another of GMO food labeling and Gunther believes labeling is inevitable. They argue that it might be wise for the food and seed industries to throw in the towel and embrace labeling, believing that activists rhetoric would be silenced and the public would move on to other more pressing issues. Although we admire their sincerity, on this issue we part ways. This 3-part series will argue that mandatory labeling of GMOs will be costly and disruptive and it will exact a high price on agriculture and the environment as well. Part 1: What Consumers and Labeling Advocates Really Want will explore consumer attitudes about GM crops, mandatory labeling, and the true economic and political objectives of proponents of mandatory labeling laws. Part 2: The Real Cost of Labeling will explain why mandatory GMO labeling proposals will inevitably result in large increases in the price of the foods and beverages we consume. It will also cause chaos in agriculture and the food and beverage industries. Part 3: GMO Labeling, Science and the Law will explore the safety and science underlying GMOs, why regulations do not require GMOs to be labeled in the US, and how the courts are likely to treat mandatory labeling laws. We have addressed some of these in articles in The Hill and the Genetic Literacy Project. Despite their high visibility in the press and social media, those who aggressively lobby for mandatory GMO labeling are a distinct minority. 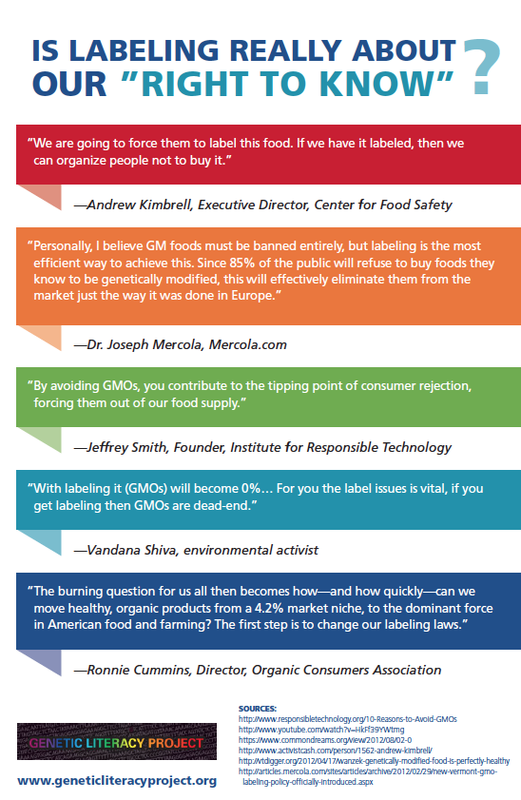 While as many as 93 percent of people have responded in polls that they believe foods containing GMOs should be "identified", those were classic "push" polls in which consumers were asked various forms of the leading question: "Do you support labeling of GMOs?" That's a combination of negative stigmatization and suggestive questioning. When consumers were asked the unprompted open-ended question if there was anything not now on labels that they would like to see added only 4 percent of Americans mention GM labeling as information not presently on labels that they want on labels. 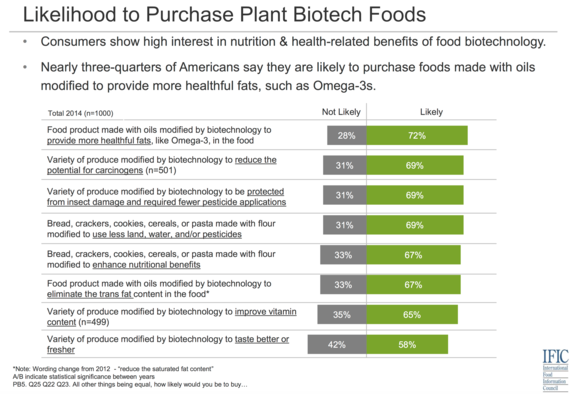 Among all respondents, 8 percent wanted additional nutritional information; 5 percent wanted more ingredient information. Some 19% opposed the current FDA food labeling policies and 28 percent reported viewing GMOs unfavorably--but equal numbers of people had positive or neutral impressions. This survey, and others like it, show that the overwhelming majority of people--89 percent in this survey--have little understanding of the technology or its potential impacts, good or bad. 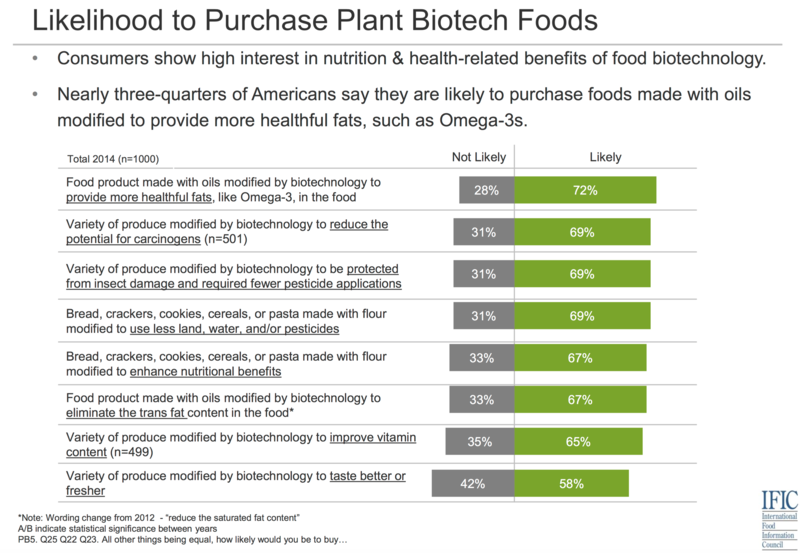 Not only do respondents willingly admit to having little knowledge about GMOs, a considerable majority indicates that they are in favor of GMOs that improve nutrition, reduce the use of pesticides, or are in other ways good for the environment. It turns out most of us are not anti-science or anti-technology. We just want to know that the food we eat is safe for us and that it's production is sustainable. It certainly doesn't help reassure consumers that apparently sincere fellow citizens are militantly campaigning for labels on GMO-containing products. Studies have suggested that some consumers may regard the mandatory GMO label as a safety warning. After all, why would government mandate a label on food if they weren't trying to warn us of something? Claims that one study suggests that most consumers would shrug about a GMO label are entirely theoretical. There is no case study for instituting labeling in a country where food products have gone unlabeled for 18 years, where labeling creates a stigma that can radically impact consumer behavior, and anti-GM activists would continue to aggressively try to stigmatize products produced by a process that science says has no material or safety impact on the crop or food product. Since 70-80% of processed food products contain GM ingredients, consumers would see a lot of labels in a supermarket--studies show they couldn't explain what GMOs are, or worse, the explanations they might give would be erroneous. Often the so-called GMO content would be in the form of oil, sugar, starch or other highly purified ingredients that are indistinguishable from those isolated from conventional or organic crops. If a label is ultimately approved, those ideologically opposed to GM foods and crops would likely quickly transmute their "right to know" effort into a massive campaign to associate that label with health dangers and ecological disaster. Some already make such claims. Check out this infographic that the Genetic Literacy Project put together with statements by leading proponents of a "right to know". Numerous pro-labeling advocates are on public record that mandatory labeling of GMOs is just the first necessary step leading to a total ban of GM crops in agriculture. It's clear the goal of many labeling advocates is to shut down a technology and not inform the public. That's right, the people who innocently claiming that their only purpose is to ensure that we all know what's in our food are being very dishonest with us. They don't care about our right to know anything particular about food; what they care about is their crusade to ban GM crops and derail a promising technology that 90 percent of the mainstream science community believes is safe and sustainable..
Several organic food companies have been among the major supporters of state initiatives to require mandatory GMO labeling. Why would these companies pour millions into labeling the competitors' products? Two answers come immediately to mind: 1) it's no secret that organic products cost a lot more than conventional food products. If labels are adopted and manufacturers elect to sell GM-free products, as many doubtless will, the cost of non-organic products will rise significantly which makes organic products more competitive in price, and 2) it's also no secret that fear sells. The organic food industry depends on fear based marketing of their products because studies show that consumer fear is the primary driver of organic food sales. Organic marketers sponsor GMO labeling campaigns because they believe it will pay a dividend in profits. Yes, it's true, those organic food companies who project a warm and cuddly earth-saving image to consumers are out to make a profit! They may not be entirely successful at winning elections, but as we explain in Part 2 of this series, they do not have to win elections to "win"--they just have to slightly impact the balance of conventional versus organic food sales. Remember, a loss of a few percentage points of market share for conventional food products and/or companies could dramatically impact the profitability of a food or beverage company. 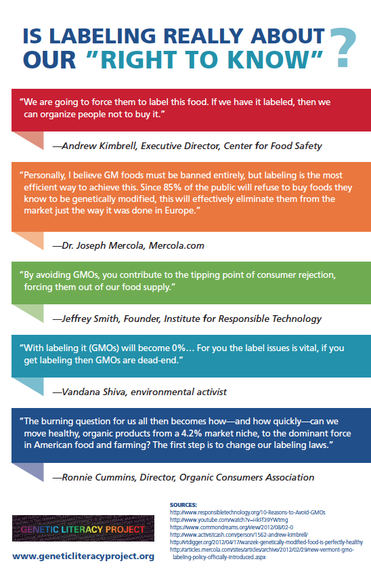 As explained above, consumer fears about GMO labels and higher costs would spur organic sales. A loss of 4% of conventional food and beverage sales would double the volume of organic food sales. In Part 2 of this series, The Real Cost of Labeling, we will explain why mandatory GMO labels would be costly to the consumer and massively disruptive to the agricultural, food and beverage industry.